I needed a fast simple chicken dish, and decided to try something new. Eric and I love Chicken Parmesan but usually I made it fancy with bread crumbs and seasonings and browning and baking and it takes a little while. I decided to keep it simple and try just browning. It started to burn a little ( I had it on high the whole time) so I pulled it out and stuck it in my oven to finish cooking (it was already on for the potatoes). I think that if you cook it on medium high it will be able to cook in the pan alone. Pour about 3 TBS olive oil into a pan and heat on medium high. Sprinkle chicken with pepper. Put parmesan on a plate or other work surface. Pat both sides of chicken onto parmesan pile to coat. When oil is hot, carefully (it will splatter!) place chicken in pan using tongs. 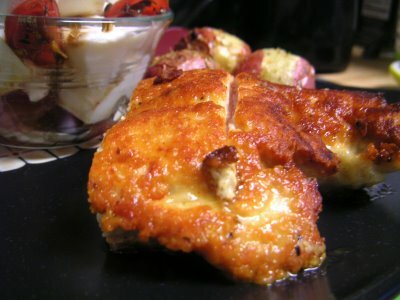 Cook about 6-7 minutes on each side until chicken has golden brown crust and is cooked through.